Singapore, 12 May 2011 – Following the success of last year's Asia's Biggest F1™ Fan, Singapore GP is upping the stakes for the popular contest and rebranding it the World's Biggest F1™ Fan for a global audience. The 2011 edition includes two play-to-win challenges instead of just one quiz component, hosted on a refreshed interactive platform boasting stunning info-graphics of the night race. In a departure from last year, both contests will not be limited to participation within Asia but open to the rest of the world. Fans have double the chance to win attractive prizes such as a trip for two to the 2011 FORMULA 1 SINGTEL SINGAPORE GRAND PRIX worth over US$10,000 and exclusive Singapore GP race merchandise valued at up to US$600. 1st Challenge: Are You The World's Biggest F1™ Fan? Back for a second season with bolder graphics and enhanced gameplay, this interactive challenge involves a race against time to complete 23 questions – same number of turns at the Singapore circuit – related to the sport's history, rules and trivia on race teams and drivers (25% of the questions are based on the Singapore Grand Prix). Players have to answer all 23 questions in six minutes or less, and the 23 highest scorers will proceed to a final elimination round on 23 August 2011 to vie for the title of the World's Biggest F1™ Fan. One winner will walk away with over US$10,000 worth of prizes including a pair of Green Room hospitality suite tickets valued at US$6,167, a 5D4N hotel stay at The Ritz-Carlton, Millenia Singapore worth US$4,058, a pair of exclusive passes to the Drivers' Autograph Session during the 2011 FORMULA 1 SINGTEL SINGAPORE GRAND PRIX race week, and round trip economy airfare for two. "What distinguishes Formula One from other premier sporting events is its historically rich legacy and ability to stay innovative, relevant and exciting with every season," said Colin Syn, Deputy Chairman, Singapore GP. "We hope to follow the same footprint by taking the Asian edition of Biggest F1™ Fan global this year. It's a great way to reward the most ardent F1 fan and at the same time, highlight the many unique points about our night race!" Last year's winner of the Asia's Biggest F1™ Fan contest, Derek Chan*, walked away with over US$8,000 worth of prizes including a pair of Green Room tickets, a 5D4N hotel stay, exclusive merchandise, and a pair of passes to the Drivers' Autograph Session. Read about last year's Asia's Biggest F1™ Fan champion. 2nd Challenge: What Makes The Singapore Grand Prix Special For You? Running parallel to the World's Biggest F1™ Fan game is a contest that calls upon fans to share a personal anecdote on what makes the Singapore Grand Prix special for them. The challenge is to write it in no more than 61 characters which is the same number of laps the drivers are required to complete at the Marina Bay Street Circuit. Participants who submit the top three best entries will win an exclusive goodie bag packed with limited edition Singapore GP merchandise valued at US$200, US$400, US$600 respectively. The contest closes on 27 November, 2011. 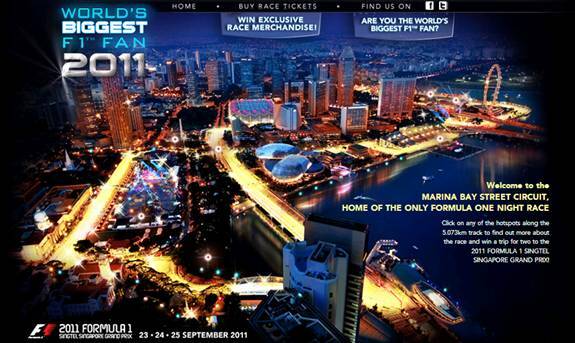 To take part in both challenges, visit www.singaporegp.sg or www.biggestf1fan.com.